Turas 1 is an engaging and creative new textbook written in line with the new Junior Cycle Irish specification. The included portfolio/activity book is combined and printed as two books in one. Real world topics are presented in a well paced and structured sequence with an emphasis on developing reading, writing, listening and speaking skills. Engaging tasks encourage students to talk to one another in Irish. Self assessment checks after key topics help students to monitor their progress. Creative pair and group work activities encourage students to engage with one another and to develop their communication skills. Listening and revision tasks appear throughout each chapter and at the end of chapter Súil Siar section. 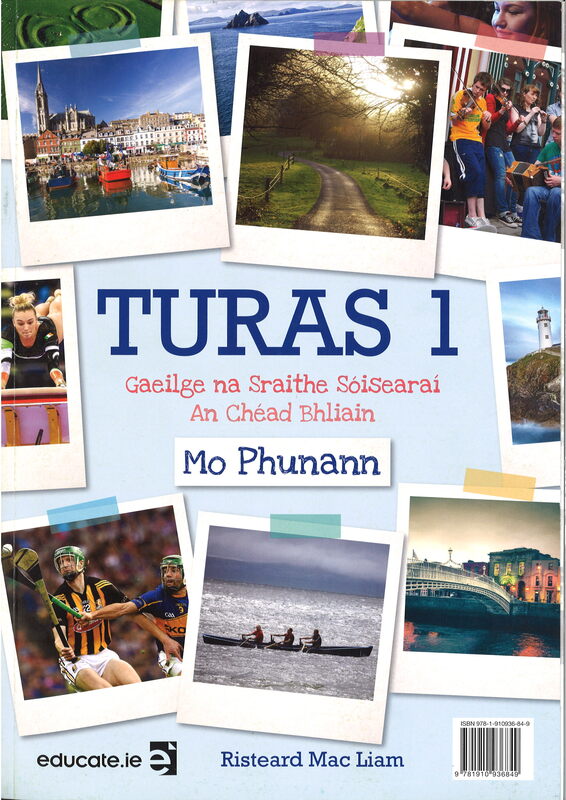 Grammar lessons appear in context in the chapter and in a separate easy to understand Treoir Ghramadaí section at the back of the book. access listening scripts to help with the listening comprehensions.